Psychologist, investment advisor, and author Walter F. Wild gives readers sound advice on savings and investment through his newest book Winning Investment Decisions. 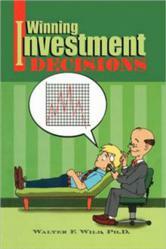 The book provides a psychological and financial perspective on investment strategy and market behavior. Dr. Wild gives his readers useful insight, especially in today’s economy, through experience gained in his own investment ventures. Wild’s book, Winning Investment Decisions, is a groundbreaking publication that provides readers with a unique perspective on the many opportunities and dangers that face investors today. It combines the financial and psychological aspects of smart investing. The book reveals several ways that investors, novices and experts alike, may use to protect and increase savings using one’s own direction without the additional financial strain or the unreliability of professional financial advisors. The book, through its clear presentation of the methods for smart investing, gives readers concrete techniques for building savings with ease and peace of mind. For more information, log on to http://www.Xlibris.com. Dr. Wild was born and raised in Hawaii. After graduating from Punahou School, he received a BA from Yale University. Then he went to Korea as a counter intelligence agent. He received an MBA, with a concentration in finance, from Stanford University, before getting a Ph. D. in Clinical Psychology from the University of Rochester. He practiced psychology in Hawaii in a state hospital, a private hospital, and a medical clinic before starting his private practice. He has successfully managed or advised several investment portfolios, including his own. Winning Investment Decisions * by Walter F. Wild, Ph.D.
To request a complimentary paperback review copy, contact the publisher at (888) 795-4274 x. 7479. To purchase copies of the book for resale, please fax Xlibris at (610) 915-0294 or call (888) 795-4274 x. 7876.